Global Manufacturer Manages Disruption, Nimbly Adapting to Changes in Corporate Strategy - E2open | Demand. Supply. Delivered. 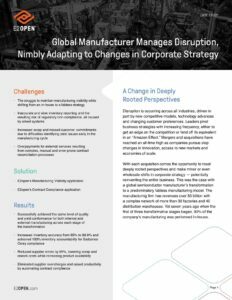 In addition to addressing internal quality control and inventory reporting pressures, a global semiconductor manufacturer sought to transition from a 90% in-house manufacturing model to 80% outsourcing. Find out how E2open’s visibility platform was instrumental in integrating a newly acquired fabless chip provider, creating a pathway to transform the entire business to execute successfully on a competitive fabless strategy.